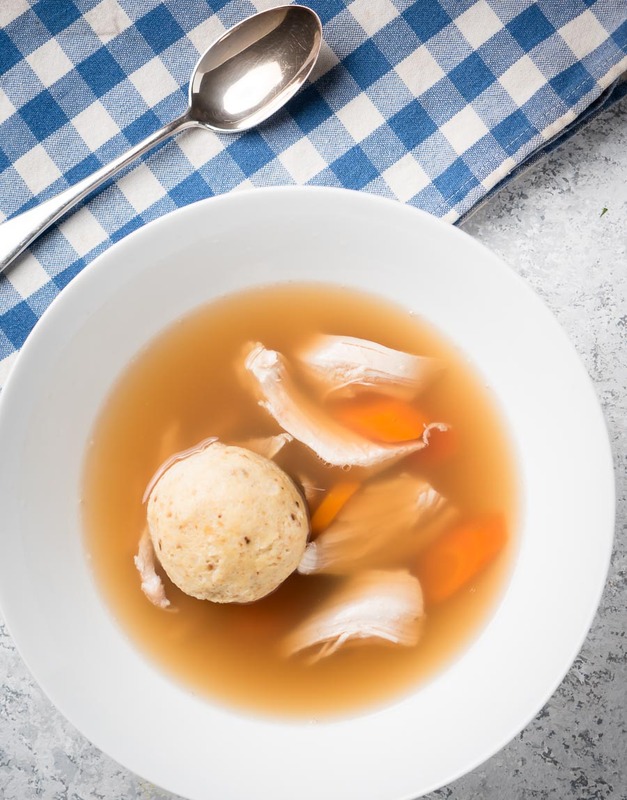 Matzo ball soup really is one of the greatest chicken soups of all time. Simple. Intense. Salty. Savoury. Wonderful stuff. Full disclosure here. This is about going for the most insane bowl of chicken soup ever. Nothing else. I am not Jewish. Didn’t grow up eating matzo ball soup. I have no fond memories or preconceptions. I know what I’ve been served at delicatessens and I want better. Better broth. Lighter matzo balls. More chicken. Just better. It’s the broth that makes it. And to make really great matzo ball soup you need to make fantastic broth. That’s what makes this recipe work. The broth is over the top. Like really over the top. Lots of recipes say toss a chicken into a pot with some carrots. Some onions. Maybe some garlic. Some water. Lots of aromatics and one chicken. That’s vegetable broth with chicken. It’s tasty. But it’s not completely over the top. Not what I want. I say start your recipe where everyone else finishes off. Make really good homemade chicken stock. Then poach a whole chicken in that chicken stock. Double down. And don’t go crazy on the vegetables. A bit of onion. A few chunks of carrot. Some peppercorns. That’s enough of that. Chicken is the star. Keep it that way. Where I live you can get kosher chickens. I don’t really care if a chicken is kosher or not. But the one’s they sell around here are well salted. Brined. Makes it easy to get a savoury bird. You don’t need to buy a kosher chicken though. You can brine the bird yourself instead. Just make sure you do. It makes a difference. Dry-brining is easy. The rule is about 1 Tbsp of kosher salt for 5 pounds of bird. 24 hours in the fridge and you are good to go. Works with turkey too. Try a dry brined turkey some time. That is a game changer. Don’t cook your chicken to death. Use an instant read thermometer. The chicken is ready to come out of the broth when it hits 175F. That makes a difference too. Moist, well-seasoned, flavourful chicken. 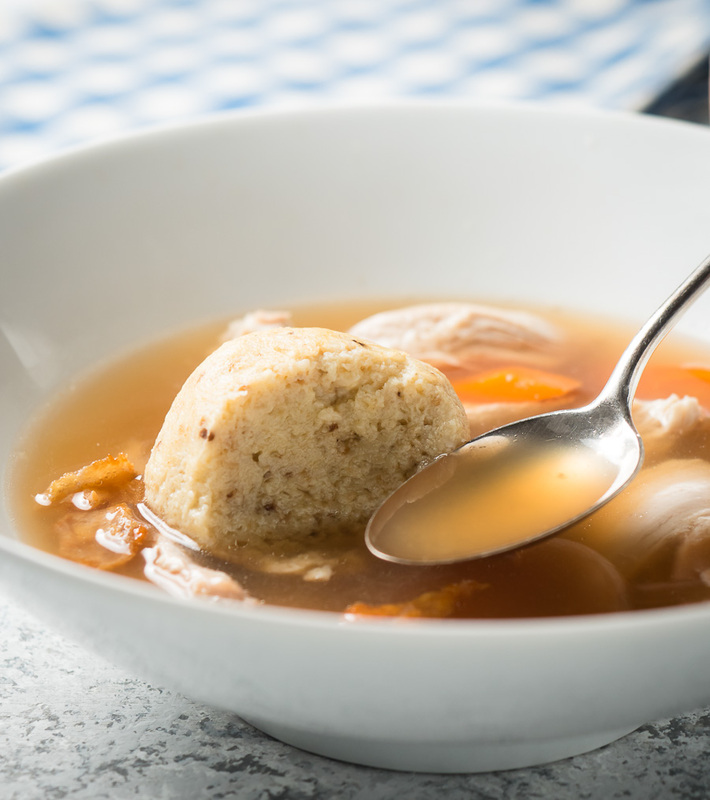 That’s what you want in your matzo ball soup. Scmaltz is a fancy word for rendered chicken fat. Like pork lard or duck fat except it comes from a chicken. And it’s what makes matzo balls special. You can’t beat that deep chicken taste. And you don’t get it with vegetable oil. And you have to make it yourself. At least I can’t buy it where I live. But it’s not hard. And it doesn’t take long. You are going to need to skin your bird before you poach it. Take the skin and fat from the bird. Cut it up. Toss it into a frying pan. Cook over low heat. The fat renders out slowly. You are done when the skin is golden. Pour that fat into a small container until you are ready to make your matzo balls. And those bits of crisply, golden chicken skin? Salt them up and eat them warm. Seriously. Could be the next bar snack. Super tasty. Or toss them into the soup. That’s what I do. That’s it. 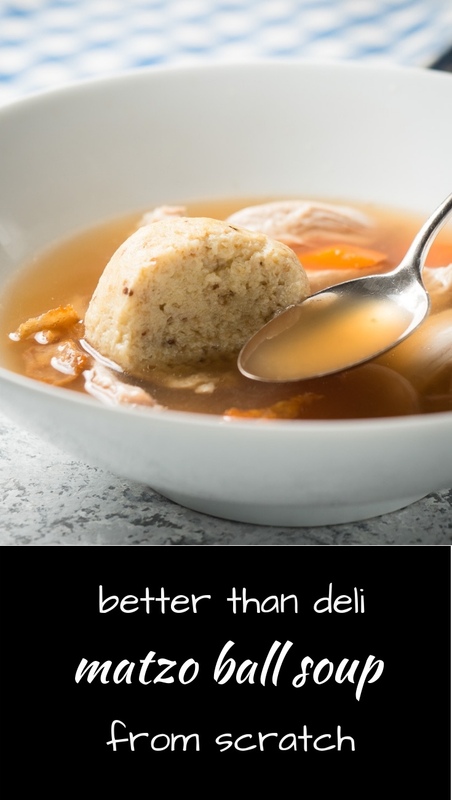 I’m a matzo ball soup heretic. But I don’t care. This is not tradition. Not my grandmothers recipe handed down on a scrap of paper. This is epic chicken soup. I care about that. Put the chicken bones in a large pot and cover with water. This should be somewhere around 12 cups or so. Cut the onion in half. Leave the skin on. Add it to the pot. Bring to a bare simmer and cover. Watch your heat after you cover it. It will start to simmer harder. Adjust your heat so you see small bubbles and the surface of the stock moves gently. You don't want this to come to a roiling boil. Wait. Let it simmer. Takes time. Like 6-8 hours. You are done when the bits of chicken taste like nothing. Cool slightly and pass through a colander to catch the bones. Let the stock cool. Congratulations. This is better than anything you can buy. Pick a pot big enough to hold the chicken. Skin the chicken. Place the chicken, half an onion and the pieces of carrot into a pot. I use a 5 litre dutch oven. Pour the homemade chicken stock overtop. Add water if needed to fully cover the bird. Add 2 tsp kosher salt. Bring to a simmer. Cover and poach the chicken. This will take around 30-40 minutes. Do not rely on time though. You need an instant read thermometer. The chicken is done when the thigh is 175F. When the chicken is cooked remove it from the pot. Careful. It's sitting in hot liquid. It's full of hot liquid. This is a trip to the hospital waiting to happen. Use tongs. Make sure you have a good grip. Let the stock drain from the cavity. Let the chicken cool until you can handle it. Remove the meat from the chicken. Set aside to cool. When it's cool shred it into fairly big pieces. Return the carcass to the pot. Simmer, covered, for another couple hours. Let cool slightly and strain through a colander. Eat the onion. It's tasty stuff. Strain a second time through a fine strainer lined with cheesecloth or paper towel. Congratulations. This is really better than anything you can buy. Taste your soup. It will not be salty enough. This soup takes a lot of salt. Make sure the broth is hot. You want your salt balance to be right for hot soup. Cool soup always needs more salt. Add a tsp of kosher salt and stir. Taste. It may need more salt. Add a half tsp of salt this time. Taste again. Keep going until it tastes right. It always amazes me how much salt this soup needs. Add the eggs to a bowl large enough to hold all the ingredients. Beat them to combine the whites and yolks. Add the matzo meal, carbonated water and salt. If you don't have quite a quarter cup of schmaltz top it up with a bit of vegetable oil. Add the schmaltz to the bowl. Stir to combine. Cover loosely with cling wrap. Refrigerate for at least two hours. It will set up when it chills. Bring a large pot of water to a lively simmer. Not a roiling boil though. 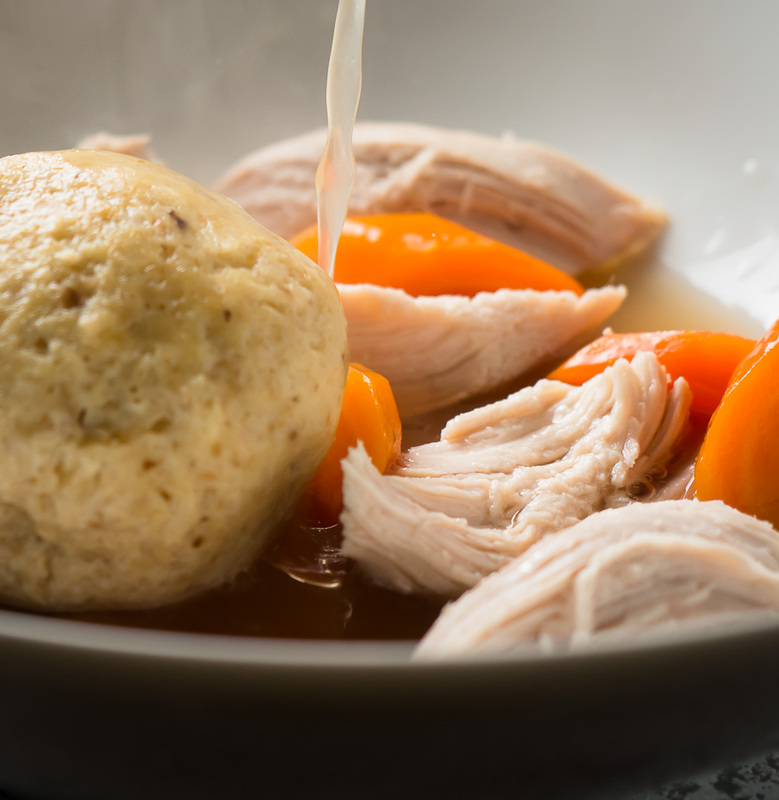 Matzo balls can self-destruct if you boil them too hard. Set a piece of wax or parchment paper on the counter. To make the balls wet your hands. Grab a golf ball worth of the chilled mixture. Form a ball. Keep your hands wet. Repeat until you've used up all the matzo ball mixture. You should get 8-10 balls. Gently lower the matzo balls into the simmering water. Cook 25-30 minutes. They should get about a little less than double in size and start to sink. That's when they are done. Pull them out gently and set aside. Cook the carrots in salted water. You could toss them in the soup to cook instead. I don't like that extra carrot flavour in the broth. Up to you. Just make sure the carrots are soft. 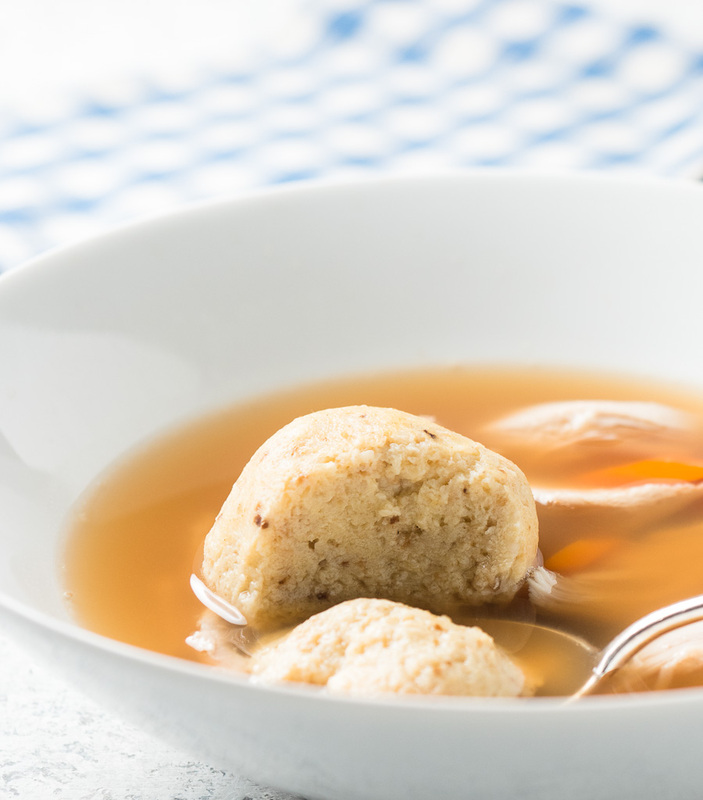 Bring the matzo ball soup broth to a simmer. 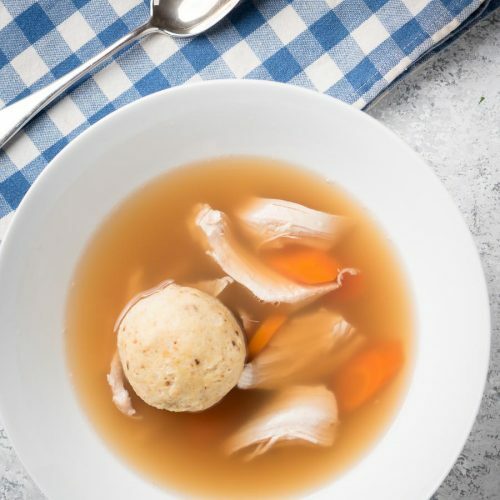 Drop the matzo balls into the soup gently to warm through. 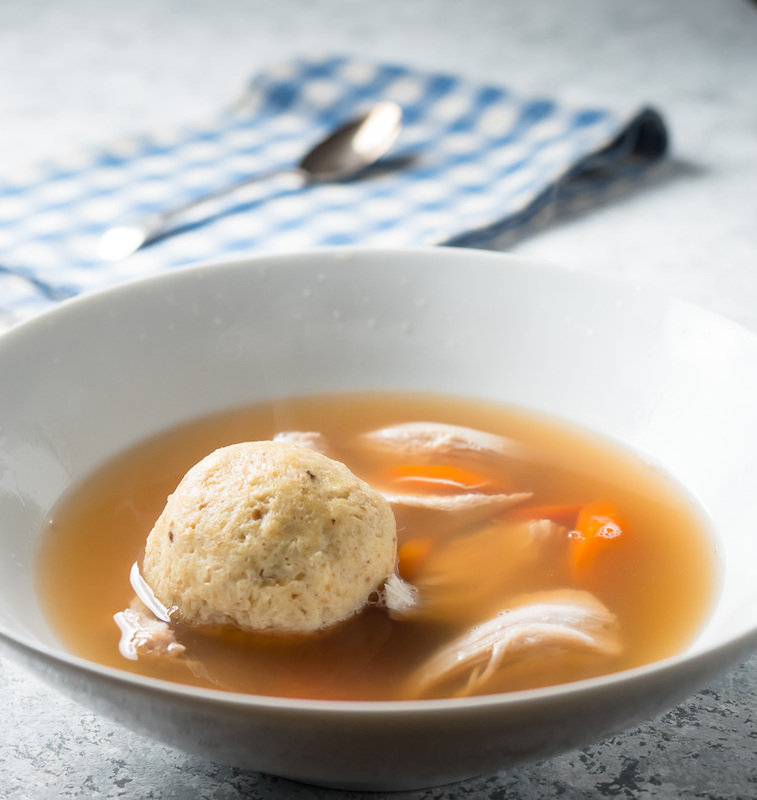 Put a matzo ball or two in a bowl. Add a good handful of chicken and a few carrot pieces. Ladle steaming hot broth overtop and serve. Some people like flat Italian parsley in the soup. If you do add a bit to garnish. Except for the cayenne the matzo ball recipe is from Bon Appetit. It's a good recipe. It works well. The carbonated water makes for nice light matzo balls. In american, appetizer, soup. Bookmark the permalink. Haha. Apologies to your wife. Its really not a lot of cayenne though. The recipe looks amazing, and, you are right, flavor and lightness of the matzoh balls is imperative. I also add parsnips, which provide richness, and a bit of fresh parsley to brighten the broth.